Power Plate – What’s all this hype about? Whether searching for pain relief, are new to fitness and seeking long-term results or are looking to maximize your current fitness level, incorporating the 3D Power Plate technology will ensure you get the best results! Water – How much should you drink? Most people fail to realize that our body’s are mostly water, even our bones are 30% water! We lose water all day long by breathing, unconscious sweating (while not exercising), and of course also in our urine and feces. If we are under stress, ill, in hot weather conditions, or actually exercise we can lose even more water. Our daily water losses need to be replaced. Only about 20% of our water needs come from foods, therefore, most of our water needs are met by simply drinking water. The problem is knowing how much water to drink. We next compared that to the recommendation to drink 8-8oz. glasses of water a day: 8-5=3 glasses short. Comparing the 5 glasses a day to the recommendation to drink half your body weight in ounces, we determined that on average, our sample of 100 patients drank 6 glasses short of meeting their water intake goal! So whether going by the 8 glasses a day rule or the half your body weight goal, on average, most people are 3-6 glasses short of drinking the ideal amount of water per day! Drink more water! Have a minimum goal of drinking 8 glasses a day, and the ideal goal of drinking half your body weight in ounces per day – each and every day! Oakley, P.A. and Baird, M.L. (2015) Do patients drink enough water? Actual pure water intake compared to the theoretical daily rules of drinking 8-8 ounce glasses and drinking half your body weight in ounces. Journal of Water Resource and Protection; In Review. Gluten – What’s the Big Deal? Why is gluten such a big deal these days? Why do so many adopt a gluten-free diet? I will tell you why! My good friends and colleagues, Drs. Tom and Stephanie Chaney, publish an exhaustive review of gluten and how it affects the body in their book: ‘Lose the Gluten, Lose your Gut. Ditch the Grain, Save your Brain.’1 I will briefly summarize the important and detrimental aspects of how gluten may worsen your health. Gluten is found in many foods (breads, cereals, cookies etc. ), and hidden in lots of processed foods like dressings, condiments, and even gum! Wheat is a grain that has the highest amounts of the protein gluten. Our body’s have a hard time digesting gluten, there are some researchers that suggest that humans shouldn’t even eat grains at all! When we do, many of us get inflammation of the intestinal lining which results in ‘increased intestinal permeability’ (a.k.a. ‘Leaky Gut Syndrome’). The body’s immune system has its soldiers, ‘Antibodies’ (Immunoglobulins, i.e. IgG, IgA etc.) which attack foreign molecules (‘Antigens’) including gluten and its smaller partly digested proteins and peptides. The more you eat gluten, the better the immune system will recognize and attack the gluten byproducts – however, any particular proteins in the body which are similar to these gluten byproduct proteins will also be attacked – so your immune system will no longer differentiate the gluten byproducts from a particular part of your body! ‘Autoimmunity’ results when your immune system ends up attacking different parts of your own tissues. This will cause ‘flare-ups’ which result in attacks of pain, swelling, and inflammation resulting from eating gluten-laden foods. Depending on which exact tissues are being attacked determines what disease might result. A scary fact is that many researchers are starting to believe that once thought of as different disease processes might actually be a single entity – the cause being the body’s autoimmune response to a constant bombardment of a gluten-laden diet (gluten reactivity). What at first may only be symptoms of indigestion, bloating, constipation, cloudy headedness etc. may be early signs of gluten sensitivities and intolerances which may lead to more serious disease processes down the road. *Get checked to see if you have a sensitivity/intolerance to Gluten – Call to book your Hemocode Food Intolerance test today! Wikipedia. Search term: ‘Gluten’ Retrieved July 7, 2015. Hunched posture is more than just a cosmetic deformity! It commonly starts with a forward head posture (see my blog on ‘text neck’) and then affects the upper back, as well as the lower back. Eventually it is a whole body collapse against the unrelenting gravitational forces. Dr. Deborah Kado, MD (UCLA) and colleagues and published in the Journal of the American Geriatrics Society in 2004. Kado examined 1353 persons aged 45-98 for hunched posture. These researchers measured hunched posture as the number of 1.7cm blocks necessary to place under a persons’ head to allow them to lay on their back with a neutral head position with upward gaze (without extending their head backwards). Follow-up exams were done on the survivors (267 persons died) an average of 4.3 years later. The authors also looked at the cause of death – they already proved poorer postured people die earlier, but how? As it turns out they found that if you have hunched posture, you have a 2.38x greater chance of dying from atherosclerosis, a 1.84x greater chance of dying from cancer, a 2.44x greater chance of dying from pulmonary causes, and a 1.37x greater chance of dying from any other disease. Yes, hyper-kyphosis or simply, hunched posture predisposes you to early demise from a variety of diseases including cancer! Obviously this may be new information for you. In fact, chances are your medical doctor will not have heard of this information either – when’s the last time they checked your posture?! This is one of the reasons why you need to take the responsibility of health into your own hands and educate yourself on what is actually important to achieve and maintain your health. Posture is certainly a central pillar to your health! (See my book: Shotgun to Health). Call to book your spine and posture check-up now! Kado DM, Huang MH, Karlamangla AS, Barrett-Connor E, Greendale GA. Hyperkyphotic posture predicts mortality in older community-dwelling men and women: a prospective study. J Am Geriatr Soc. 2004 Oct;52(10):1662-7. 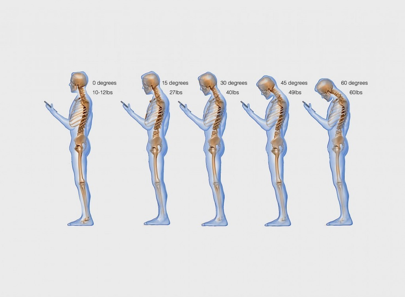 ‘Text Neck’ – Are You Inadvertently Giving Yourself Poor Health? According to Dr. Hansraj, an average head weighs about 12 pounds. The more forward your head angle becomes, the greater ‘effective weight’ of your head. At a 60° angle, the head feels like it weighs 60 pounds (as opposed to 12lbs)!1 This adds an extraordinary amount of stress to the structures of the neck including the discs, muscles and ligaments, as well as the bones and nerves. Even worse, the forward leaning of head posture leads to a worsening of your whole spine. Those older people with excessive forward hunchback postures (termed hyper-kyphosis) have had their bad postures start somewhere – and it typically starts with only a forward head position. As your posture can continue to lean and hunch forward as the years go by, a simultaneous deterioration of your health occurs. So to avoid and prevent the deterioration of your health by poor postures, it is of prime importance to not only be aware of what postures you adopt throughout the day (including while using your smartphone), but also to get a spine and posture assessment to see where your spine and posture currently is as compared to where it should be. Innovative Spine & Wellness uses state-of-the-art ‘BioPhysics’ techniques (www.idealspine.com) to correct faulty posture. By using corrective exercises and corrective stretching procedures, we can get great improvements in posture and therefore, improve your health! Call For Your Spinal Check-up Today! Hansraj KK. 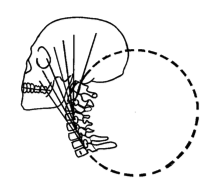 Assessment of stresses in the cervical spine caused by posture and position of the head. Surg Technol Int. 2014 Nov;25:277-9. Cailliet R. Low back pain syndrome. Philadelphia: F.A. Davis, 1981. Harber P, Bloswick D, Beck J, Pena L, Baker D, Lee J. Supermarket checker motions and cumulative trauma risk. J Occup Med 1993;35:805-811. Genaidy AM, Karwowski W. The effects of neural posture deviations on perceived joint discomfort ratings in sitting and standing postures. Ergonomics 1993;36:785-792. Rys M, Konz S. Standing. Ergonomics 1994;37:677-687. Powers C, Maffucci R, Hampton S. Rear foot posture in subjects with patello-femoral pain. J Orthop Sports Phys Ther 1995;22:155-160. Eklund J, Odenrick P, Zettergren S, Johansson H. Head posture measurements among work vehicle drivers and implications for work and workplace design. Ergonomics 1994;37:623-639. Watson A. Sports injuries in footballers related to defects of posture and body mechanics. J Sports Med Phys Fitness 1995;35:289-294. Beaman DN, Graziano GP, Glover RA, Wojtys EM, Chang V. Substance P innervation of lumbar spine facet joints. Spine 1993;18:1044-1049. Ganju A, Ondra SL, Shaffrey CI. Cervical kyphosis. Techniques in Orthopaedics 2003;17:345-354. Davies JW. Man’s assumption of the erect posture: Its effect on the position of the pelvis. Am J Obstet Gynecol 1955;70:1012-1020. Offierski CM, Macnab I. Hip-spine syndrome. Spine 1983;8:316-321. Tsuji T, Matsuyama Y, Goto M, et al. Knee-spine syndrome: correlation between sacral inclination and patello-femoral joint pain. J Orthop Sci 2002;519-523. Lee CS, Lee CK, Kim YT, Hong YM, Yoo JH. Dynamic sagittal imbalance of the spine in degenerative flat back. significance of pelvic tilt in surgical treatment. Spine 2001;26:2029-2035. Lind LR, Lucente V, Kohn N. Thoracic kyphosis and the prevalence of advanced uterine prolapse. Obstet Gynecol 1996;87:605-609. Mattox TF, Lucente V, McIntyre P, Miklos JR, Tomezsko J. Abnormal spinal curvature and its relationship to pelvic organ prolapse. Am J Obstet Gynecol 2000;183:1381-1384. Winans HM. Anemia in the aged (Syndrome of kyphosis, gastric hernia, and anemia). Texas J Med 1938;34:422-423. Hansson KG. Body mechanics in geriatrics. J Am Geriatrics Soc 1954;2:429-433. Lennon J, Shealy N, Cady RK, Matta W, Cox R, Simpson WF. Postural and respiratory modulation of autonomic function, pain, and health. Am J Pain Manag 1994;4:36-39. Weiss HR. The effect of an exercise program on vital capacity and rib mobility in patients with idiopathic scoliosis. Spine 1991;16:88-93. Riskind J, Gotay C. Physical posture: Could it have regulatory of feedback effects on motivation and emotion? Motivation Emotion 1982;6:273-298. Keller TS, Harrison DE, Colloca CJ, Harrison DD, Janik TJ. Prediction of osteoporotic spinal deformity. Spine 2003;28:455-462. Freeman JT. 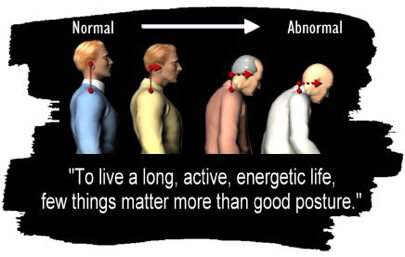 Posture in the aging and aged body. JAMA 1957;165:843-846. Milne JS, Williamson J. A longitudinal study of kyphosis in older people. Age Ageing 1983;12:225-233. Anderson F, Cowan NR. Survival of healthy older people. Br J Prev Soc Med 1976;30:231-232. Harrison DD, Harrison DE, Janik TJ, et al. Modeling of the sagittal cervical spine as a method to discriminate hypo-lordosis: results of elliptical and circular modeling in 72 asymptomatic subjects, 52 acute neck pain subjects, and 70 chronic neck pain subjects. Spine 2004; 29(22):2485-2492. Harrison DD, Janik TJ, Troyanovich SJ, Holland B. Comparisons of lordotic cervical spine curvatures to a theoretical ideal model of the static sagittal cervical spine. Spine 1996;21:667-675.